As a frontwoman of The Scissor Sisters band, Ana Matronic will surely bring associations with a passion for electronica. Since the realm of music reveals strong dependency on automatization, it is hardly surprising that the author would not sequester the presence of automatons. As Matronic boldly states in the Introduction part of her robot-oriented vademecum, she is a lover of robots since childhood. This statement is corroborated by her bold presence in the media. In an article for The Guardian, she advocates for a more humane approach to robots as they are “machines of human creation” (Ana Matronic, theguardian.com). Discriminating between artificial intelligence and the subtleties of human perception of the world, she attempts to dissipate culturally-nurtured technophobia and encourage people to treat robots as partners, not as slaves. Her unique perspective on the problems that are barely on our doorstep, heralds patience and openness with which she treats both an automaton and a reader of her newly-published book. Robot Universe is a miniaturized quasi-encyclopedia which, for the purposes of differentiating between fact and fiction, is divided into two parts: Robots Imagined and Robots Realized. Since the thickness of this book can be compared to a short novel, it is impossible to expect that all robotic creatures will be included and properly scrutinized. 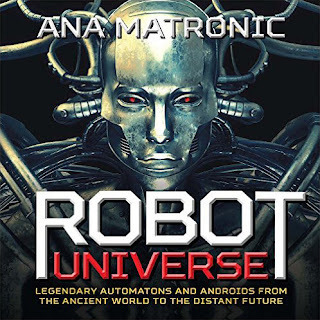 As Ana Matronic confirms herself, the first section of the book lists “the 65 most iconic fictional robots” (p. 7), and provides arguments as to “why [she thinks] they deserve to be on the list” (p. 7). The other section is comprised of 35 examples of automatic machines that are already pushing our modest present into the world of tomorrow. Additionally, each section is divided into a few subsections that facilitate the intake of information a reader wishes to acquire. A brief introductory note opening each subsection is concise, witty and oftentimes hilarious. Matronic admits that her book was an effect of her personal passion for robots, and that, though inspiring surely compromised the objectivity of her study. Yet, as an aficionado opening her heart and mind to other like-minded people, she did not concentrate merely on the characters from her childhood or puberty, but rather chose to expand her half-professional research into the ‘prehistory’ of the automatons. The result of her endeavors is a collection of samples that concentrate on both well-known and completely obscure robotic creatures. A plethora of promos and film frames populating the Robots Imagined section reveals the strong impact of the Hollywood-based productions on the perception of the author. It might seem a bit of a cliché to review a Star Wars duo of robots, Star Trek’s Data, Alien’s Ash or Metropolis’s devilish Maria; their impact on the shape of the popular culture had already been (re)viewed by both, academic professionals and eager aficionados in countless publications and incarnations. Yet, analyzing the world of robots without their inclusion could be compared to a gateaux deprived of a topping. Their lucre image, much advertised by the mass media, anchors the viewer’s perception of automatons, as these stand-alone, metallic creatures resist time and rust most efficiently. Therefore, an analysis of their presence, no matter how superficial it may be, constitutes a compulsory inclusion into the book. Robot Universe, as almost every cinematic hardcover blockbuster, cannot escape the flaw of the form overpowering the content. Glossy, high-quality paper and stunning illustrations mask the superficiality of the attached descriptions. Brief, concise and based on personal remarks, the texts reveal the author’s emotional involvement hindering a pursuit of refined objectivity. Nonetheless, it is that entertaining nature of Matronic’s slaphappy ambiance of descriptions that captures the attention of readers. As a result, the readers, encouraged by quite a tasty topping, are prepared to penetrate some less-explored faces of the Robot Universe. Therefore, betwixt the famous personas, one can find automatons who are unknown to the Eastern or Western world, having been placed on the scrapyard of postmodern culture. This group contains the jewels of robotic history whose providence often reaches Asiatic regions. Such characters include Mater Yan Shi’s Mechanical Man (400 BC) or Gakuntensoku (1929). Their unexpected presence not only allows for initial understanding of the robotic genealogy, but, as in the case of the latter, pinpoints a few crucial differences in the perception of automatons in both types of culture. As Matronic rightly observes, the Western “[robots] are used to demonstrate uncanny achievement, serve as cautionary tales, provide crucial help, comic relief, or a perspective different from human” (pp.7-8); at the same time, “Japan has enjoyed a long love affair with the robot, without the fear and skepticism inherent in Western culture” (p. 162). This awareness enables the reader to comprehend how a general idea of a mechanized creature was formulated by different generations of people, adding more blocks to the creation of an artificial Babel tower. As the bricks of perception differed so boldly, the monument constructed has given rise to quite dissimilar forms, especially in the world of the Far East. Thus, the openness to the realm of the artificial can somehow explain the prevalence of the Asia-originating automatons in the Robots Realized section of the book. This, however, does not need to provoke the West-East friction, as the presentation of robots seems unobstructed. This has been achieved by the author’s use of a widely-utilized stratagem: mind-mapping. Matronic leads a reader through each subsection rather intuitively, relying on the power of the mind to form connections between the characters presented. As a result, the analysis of C3PO easily leads to Robbie Speedy, while the latter sends us to Robby the Robot. All three automatons are bound by Isaac Asimov’s fundamental Three Laws of Robotics interpreted in ways which best describe the zeitgeist of the epoch. This rather unchronological approach defies the encyclopedic or quasi-dictionary standardization, effectively hindering boredom of perception and the narrowness of formal classification. It allows the reader to see and realize similarities binding the characters, and gain awareness of the specifics ruling the image of each robot constructed by and for pop culture. As a result, a peculiar type of mental map is drawn while reading a book. In case finding information about a specific robot was required, the reader is supported by a more ‘palpable’ map in the form of an index which lists the names of all the characters in alphabetical order. This user-friendly approach, however, lacks the proper formation of a background, as mind mapping’s most significant flaw relies heavily on connecting certain features while excluding the content that is considered less important for a given study. As a result, the reader, being provided with some basic information and Matronic’s emotive interpretation, is deprived of an objective description which would direct them into a more comprehensive and detailed study of the presented subjects. Furthermore, a lack of stable chronology facilitates chaos, obstructing the view of evolution that automatons have been subjected to in the course of a millennium. Sadly, some bits of trivia, no matter how fascinating, will never replace order that is necessary to take a step back from a culture one normally indulges in, and observe the processes of AI’s (re)formation from a distance. The Robots Realized part slightly averts this course of writing. Kept in a light-hearted tone known from Robots Imagined, the second section abounds in more data that a reader may expect. Starting from the less state-of-the-art robots such as Ultimate, Bigdog or Stargate-style Packbot, Matronic chooses a more organized and chronological approach to the subjects discussed. Yet, even by introducing this correction, the author’s choice is determined more by intuition rather than actual numbers. Nevertheless, with progress in mind, Matronic guides the reader so deftly that they are able to gain an evolutionary-oriented perspective on the procession of robots in the world outside books and television. Being definitely less extravagant than the automatons typical for science fiction literature and cinema, modern robots prove that, similarly to their fictional sibling, they can wed intriguing design with specifications of desire. A fruit of such a marriage is AIBO, an electronic pet which resembled a dog. Feeding on electricity only, AIBO was presented as an ideal companion for people who cherish the comforts of technology. Other robots of interest include Lego Mindstorms, the small automatons built of plastic blocks, or a more programming-oriented NAO. Roomba, on the other hand, is a modest cleaning robot that has already won the hearts and minds of countless overworked people who prefer to delegate some of the tedious chores to the mechanized assistant. Apart from polishing floors, some of the automatons are capable of performing complex activities, such as rolling and playing with balls (Justin), running (Asimo), or bringing emotional comfort (Paro). Others specialize in recognizing speech patterns (Kismet). However, despite the prevalence of the robots enumerated in this book, a majority of those discussed are either prototypes waiting for mass production, or machines that will always remain outside the reach of a common user. The combination of unearthly sophistication and rarity of appearance emulates the crudeness many of these robots display, allowing the reader to perceive them as almost on a par with their fictional counterparts. Matronic was surely aware of the effect the merger of fiction and progress can make on a reader. Therefore, the most astounding of the automatons are left for the end of the book. Designed to mimic some human complex behaviors, they imitate life and are capable of evoking feelings in people. Among this limited group one can adore a human-like Repliee Q1, who can engage in conversations with people, and Bina 48, who, apart from having a human appearance, is the robot that can actually express its feelings and thoughts. Being a ‘copy’ of a living person, Bina 48 breaks the boundary between complex machinery and a full-fledged AI. Finishing Robot Universe with the description of that telling prototype, Matronic was able to wittily form a bridge between the two seemingly dissimilar parts of the book. The conclusion arising from this peculiar interaction of illusion and reality allowed her to prove that the world of tomorrow transcends the boundary of the fantastic, ready to enter human lives. Despite its imperfections, and the lack of objectivity on the part of the author, this quasi-vademecum provokes imagination and awakens curiosity, serving as an engaging and entertaining read. Intimate and devoid of encyclopedic mundaneness, Robot Universe imperceptibly installs the virus of AI inside the human mind, evoking a passionate hunger that does not let itself be satisfied quickly. Brace yourself, then. A true robotic invasion is upon us!